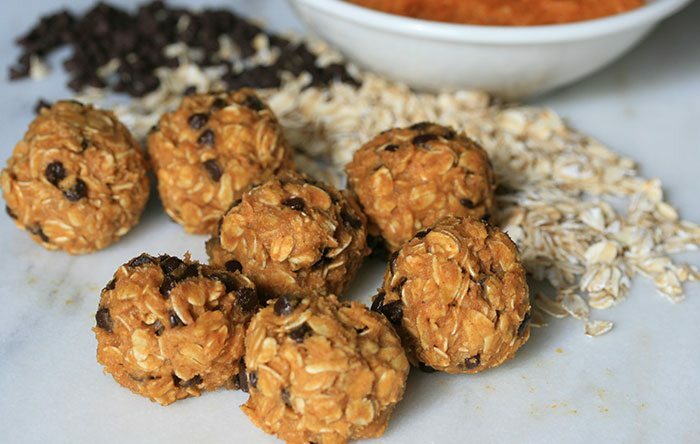 I wanted to share with you my PLAN for staying healthy this Halloween and not resorting to eating my kids' candy - Pumpkin Oatmeal Energy Balls! Hurry to the store before trick-or-treating starts if you don't already have all of the ingredients to make these as they are so easy to make, filling, and nutritious! No baking required! Mix, roll, and enjoy! In a medium bowl,a add 1 and 1/2 cups oats, peanut butter, pumpkin, chia seeds, honey, vanilla, and cinnamon. Stir to combine well. You want the mixture to be soft but not too sticky. If you pick up a generous spoonful, you should be able to roll it into a ball and only make a minimal mess (it should stick together when rolled but still feel tacky on your hands). Depending on the type of oats you used (old-fashioned or quick oats), you made need to add up to a half cup more oats and stir until you reach the desired consistency. Again, it’s ok if it’s a little sticky because the oats will absorb some of the moisture after a little time passes, but unworkable sticky isn’t the goal. When the mixture is workable, add the chocolate chips and stir to combine. Scoop a large spoonful into your hand and roll into balls. Repeat with remaining dough. Keep these in the fridge for up to a week, or in the freezer for much longer.